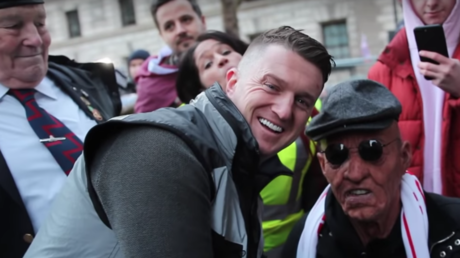 British right-wing activist Tommy Robinson has been punked by the same YouTube comedian twice in a matter of months. This time the stunt involved an old man mask, a wheelchair, and a pro-Brexit rally. Tommy Robinson is well known for his views which oppose immigration and Islam, and he happens to be the founder of the highly controversial English Defence League (EDL). He and his organization have managed to collect more than a few enemies in the UK, including a guy by the name of Niko Omilana. So after another prank at the expense of Robinson went off without a hitch in August, Omilana decided to go back for more. This time, he donned an old man mask that was eerily realistic, a hat that any stylish grandpa might wear, and a wheelchair. He then embarked on a pro-Brexit rally where Robinson was speaking, and made it his mission to speak to the controversial activist. Omilana was unrecognizable as he arrived and was pushed through the crowd by his friend, who posed as his grandson. The marchers were more than happy to shake hands and speak to the undercover Omilana, who was quick to insult all of them to their faces – which went entirely over their heads. “You what mate?” the person replied. Once Omilana made it closer to the stage where Robinson was speaking, it became clear that being pushed in a wheelchair came with a major advantage. It took almost no effort at all to get security to agree to let Omilana through the barricades to speak to the right-wing activist. And when he got there, he was able to get Robinson to look straight in the camera and encourage viewers to buy an NDL sweatshirt. The fact that it was a prank didn’t even remotely register with Robinson, which is interesting considering he had been tricked into saying pro-NDL slogans in August, too. “We made our way through all of these people and planted an NDL hoodie – this is a big troll,” Omilana said after the mission was completed.